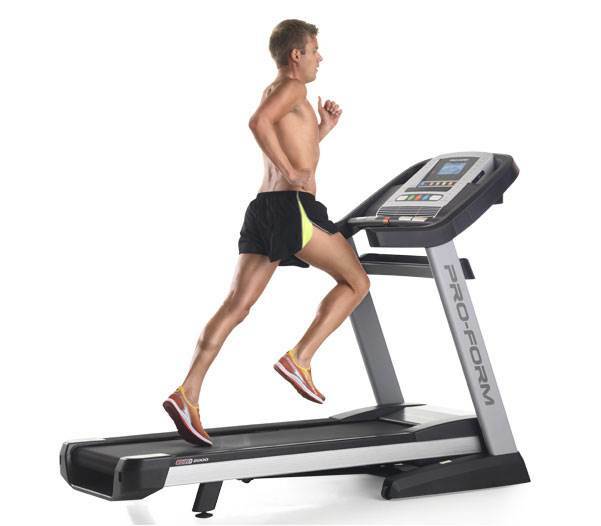 Non-folding treadmills tend to be more stable, a feature that may be important to some runners. 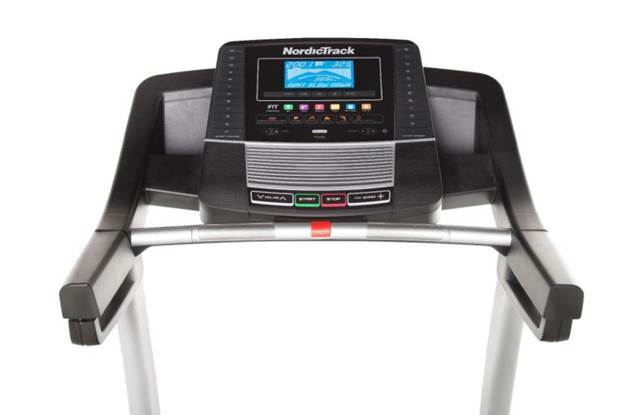 Folding treadmills, including the budget versions, can save space. 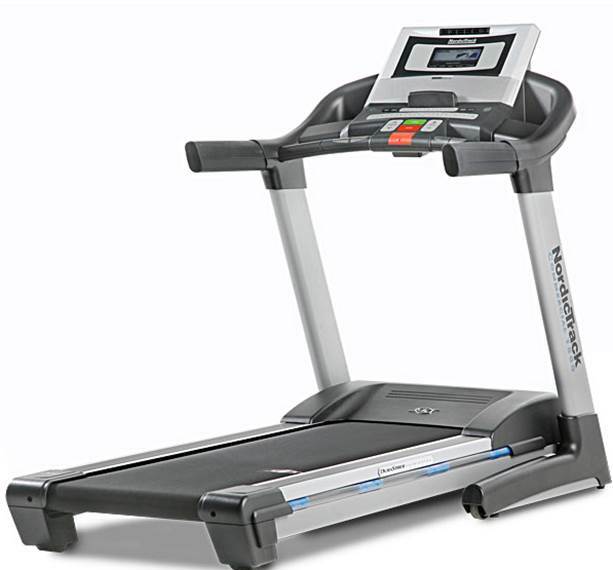 CR Best Buy: These treadmills offer the most performance for the price. All of them are recommended. 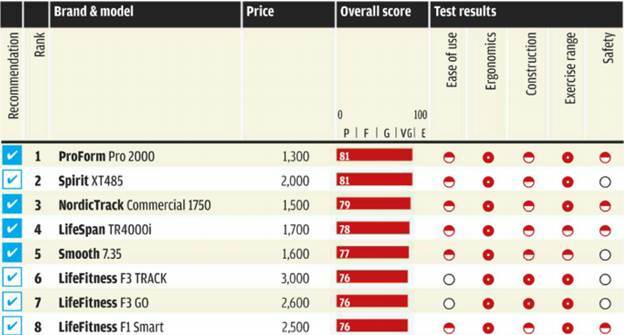 Recommended: These high-performing models are all fine choices and include CR Best Buys. All have chest-strap heart-rate monitors and heart-rate control programs. A1 has the highest maximum incline but the shortest running track of the group at 57inches. The motor in A2 is equipped with the most horsepower, but the machine’s deck is shorter, at 58 inches, than A3, which has a 60-inch running surface. A1 has a 22-inch-wide track, which may be hard for some users to straddle when standing on the side rails. All have quick incline and speed controls and come with chest-strap heart-rate monitors, but only B2 is equipped with a heart-rate control program. B1 has a longer 61-inch running surface and the highest maximum incline of the bunch. Only C1 offers a chest-strap heart-rate monitor, and none have heart-rate control programs. C3 has a significantly lower maximum incline, but its motor offers the most horsepower. C2 has the shortest running surface, at 57 inches. 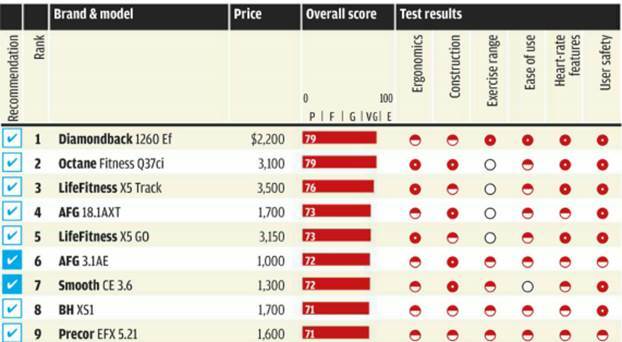 Overall score is based on ease of use, ergonomics, construction, exercise range, and safety. Models are grouped as labeled and are listed in order of precise overall score. Ease of use is how easy it is to adjust exercise intensity, read the display, and operate monitor functions. Ergonomics is how well the machine accommodates users of different sizes. That includes belt size and foot-rail and handgrip design. Construction is our judgment of quality and the results of quality and the results of our durability tests. 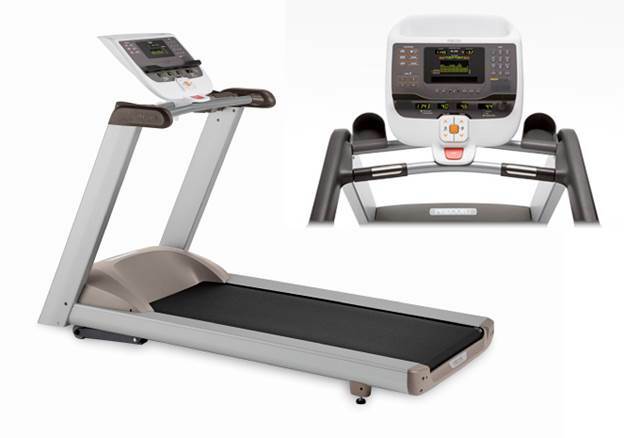 Exercise range is how well each machine provides an effective workout for users of various fitness levels. Safety is our assessment of safety and security, including stop-btton size and location, safety-key operation, the possibility of striking the motor housing, and the security of the deck when folded. Price is approximate retail. Use your smart phone to download the RedLaser or ShopSavvy app and scan the code for video. 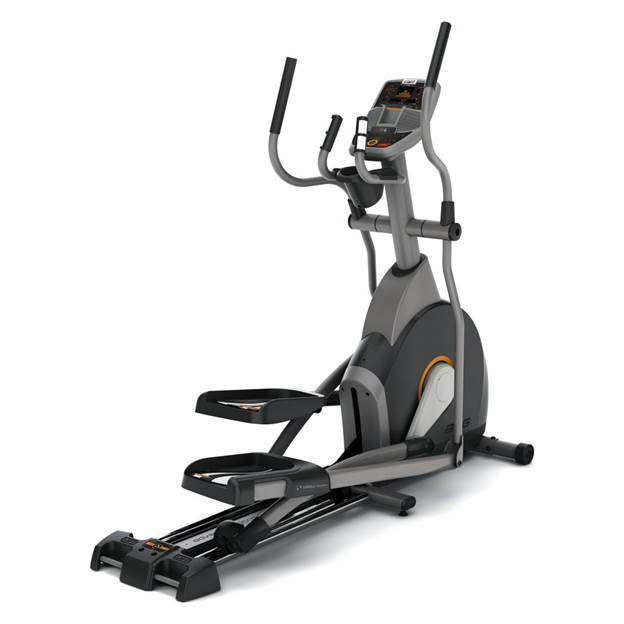 A good elliptical is sturdy, easy to use, and aligns with your natural running motion. None of the models listed in the Ratings can be folded for storage. B1 includes a chest-strap heart-rate monitor and four stride-length settings; B2 offers one. A new type of fitness equipment lets you “run” outside without having to pound the pavement. 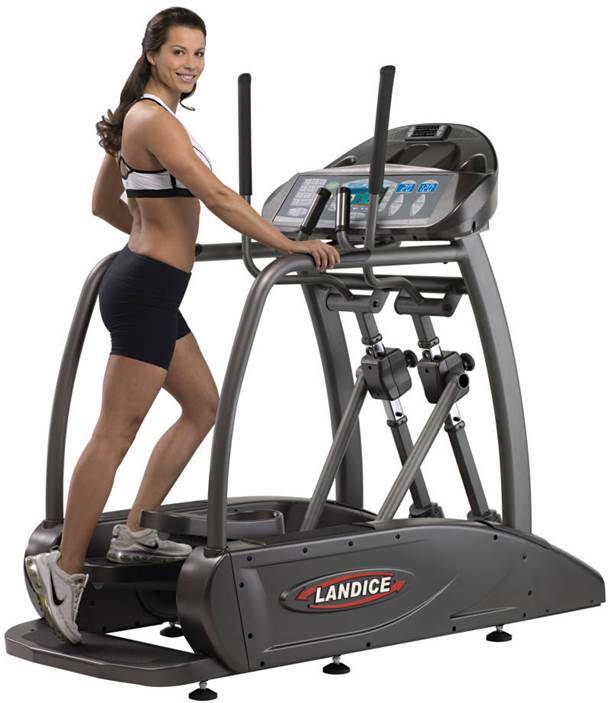 The rider pedals while standing up, propelling it with the same elliptical motion used with the indoor exercisers. We tested two three-speed elliptical cycles: the ElliptiGo 3C ($1,800; elliptigo.com) and the StreetStrider Sprinder 3r ($1,600; streetstrider.com). The StreetStrider comes in a one-speed version, too. 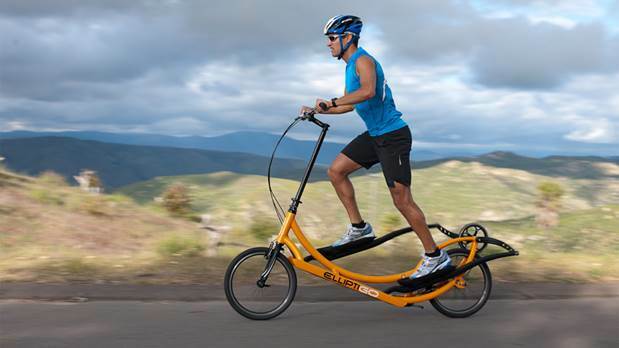 Both also come in an eight-speed version, and the ElliptiGo also offers 11 speeds. All can be adapted for use as stationary trainers. But there are key differences between the brands. The two-wheeled ElliptiGo 3C was the preferred choice of our 14 panelists, accommodating people of various sizes and rated easier to ride, turn, and climb. It has a tall bike-like handlebar for steering and shifting, meaning the cycle doesn’t offer an upper-body workout. The ElliptiGo 3C cycle was the preferred choice among our panelists. The StreetStrider Sprinter 3r travels on three wheels and offers a slightly smother ride. Its two handgrips move back and forth with the motion of the pedals, similar to a traditional elliptical exerciser. As a result, the cycle must be steered by leaning your body, as if you were slalom skiing. That proved to be challenging for some testers. Also, taller riders occasionally hit their knees on the moving handlebars. If you want the versatility offered by exercise programs and personalized feedback, stick with a traditional indoor stationary elliptical. For outdoor enthusiasts, these elliptical cycles seem to offer a more intense workout than cycling. But overall, almost all of our panelists preferred a conventional bicycle, which is significantly lighter and easier to store than either of the tested models. The ElliptiGo and StreetStrider can be a fun addition to your fitness or recreation plans, but make sure you use them on paved trails away from cars, at least until you master the techniques. And always wear a bike helmet.